Our last meeting before the summer break was a visual treat with sensei Padma Swaminathan demonstrating freestyle in her inimitable way with lovely baskets. 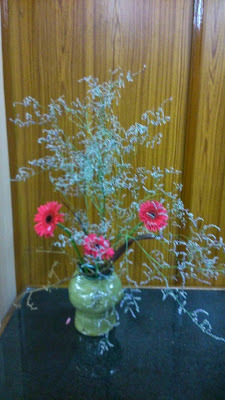 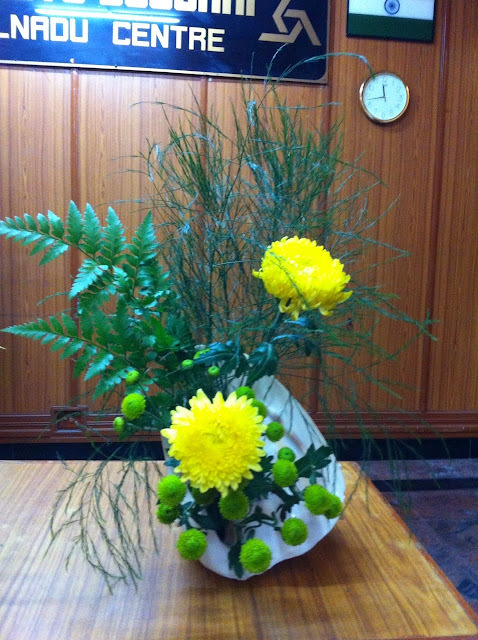 Her first moribana arrangement was highlighted with a Japanese umbrella, complemented with Dressina, Carnations and gypsophelia. Her third piece was this beautiful composition which had depth with the use of several materials in a well balanced arrangement. 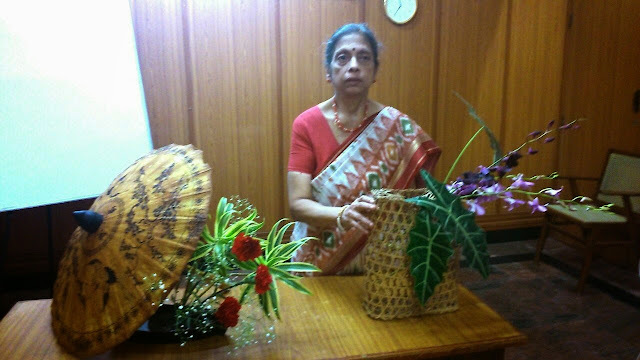 To the surprise and delight of all, Padma sensei then auctioned the parasol and the fishing basket, and donated the proceeds to the Study Group! 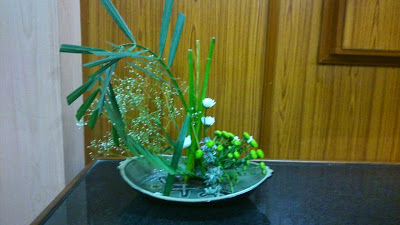 A Big thank you, Padma sensei! 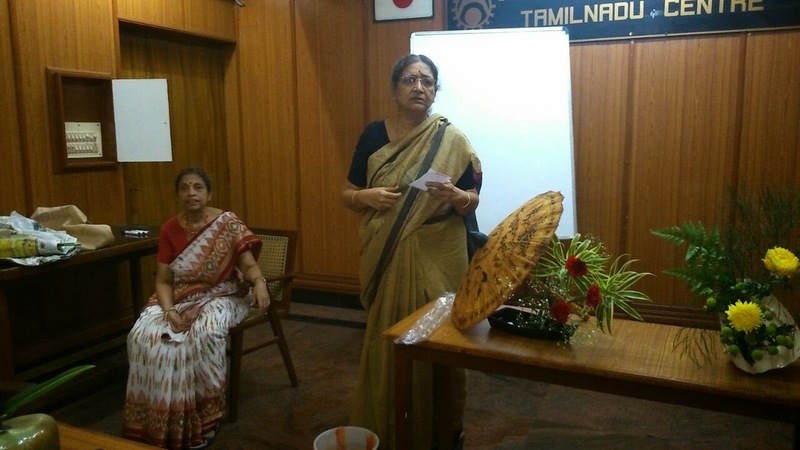 The Group then proceeded into a workshop, with all trying their hand at freestyle composition. In this moribana, Trishala looked to display the inner surface of the bowl, echoing the design in her linear structure. Chitra complemented the circular shape of the jar, with a circular mass of golden candle flowers. 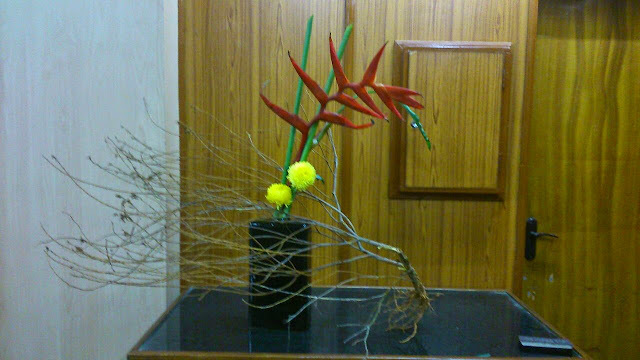 Prerana - created a large, dramatic composition, displaying bold horizontal lines of the dried branch which echoed the shape of the heliconia. 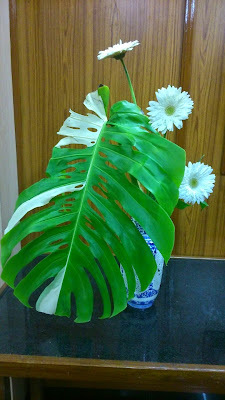 Variegated monstera was the centre of Pushkala's composition, choosing to use the vase as a holder rather than an important part of the composition. 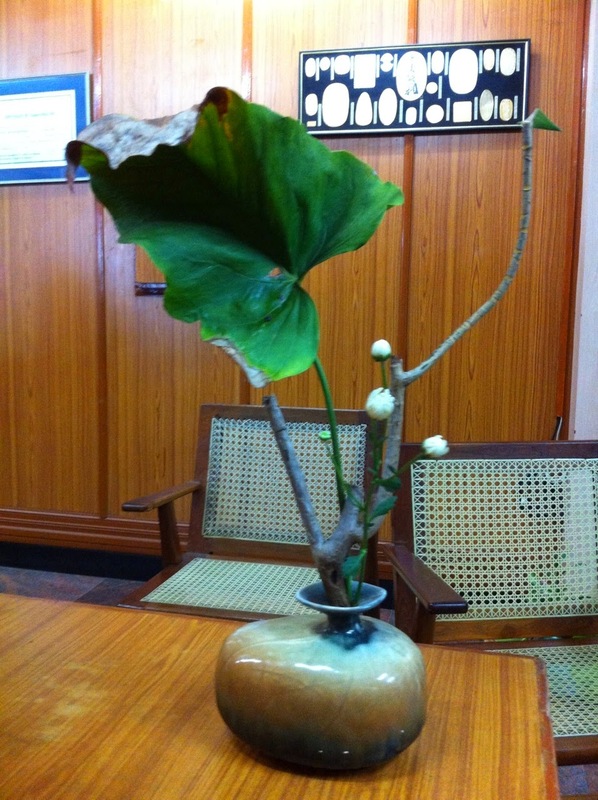 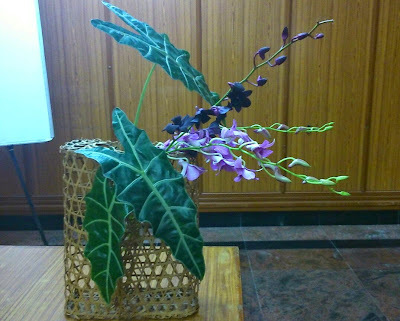 Malathi sensei worked with an earthen ceramic container, complementing the shape and texture with the anthurium leaf, and a bare line of Copsia, with a bit of color from the chrysanthemum buds. 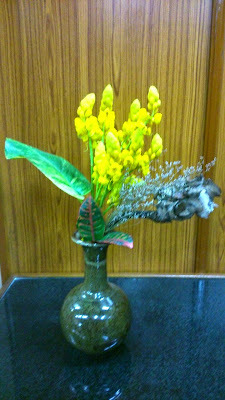 Zaitoon was flamboyant with a big spray of limoneum, which allowed for the vase to be seen and be a part of the composition, and the dramatic jerberas, brought flower color. Sensei Meenu's moribana composition in a bamboo bowl was best viewed from the top, the dry material complementing the browns of the vase beautifully. 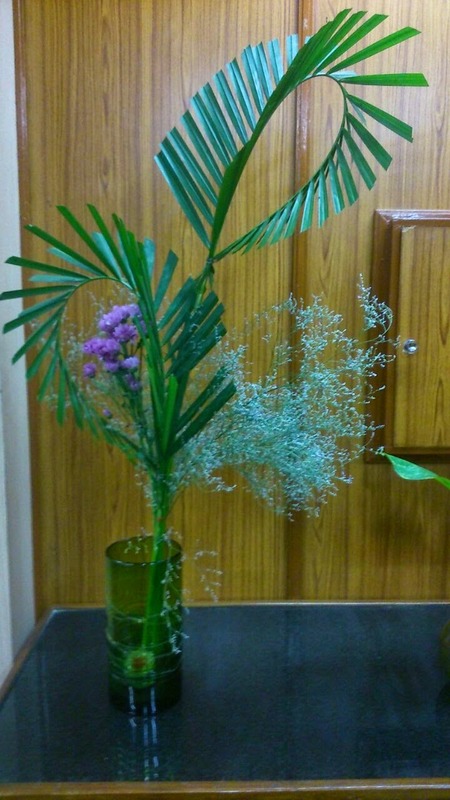 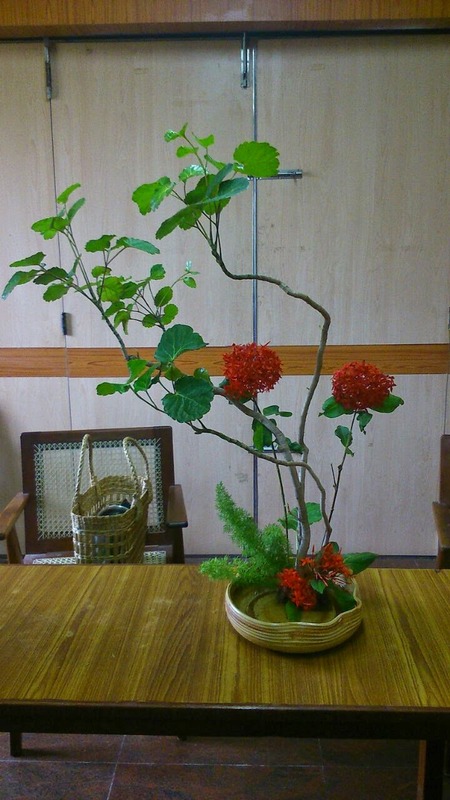 Janaki worked a graceful moribana composition, with tall arelia leaves, using space to advantage, ixora for color, and foxtail leaves to bring depth. 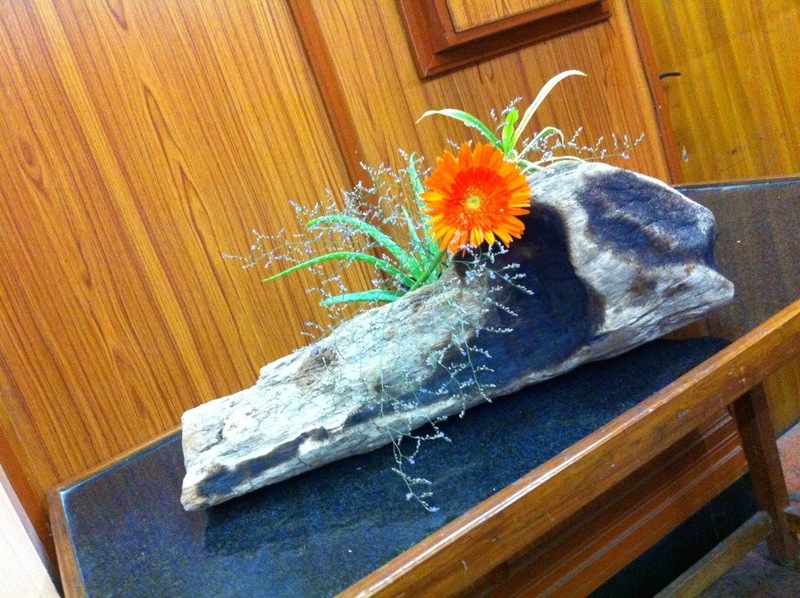 Chelvi focussed on the contours of a driftwood she found. 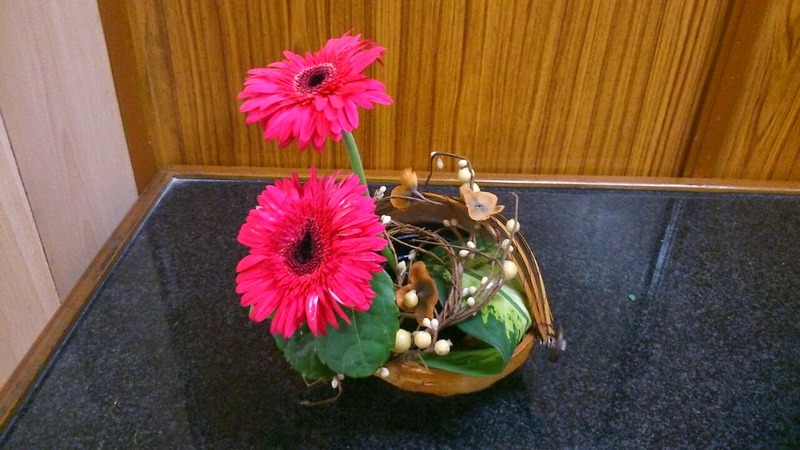 A simple accent with a single jerbera recreated a rustic scene. 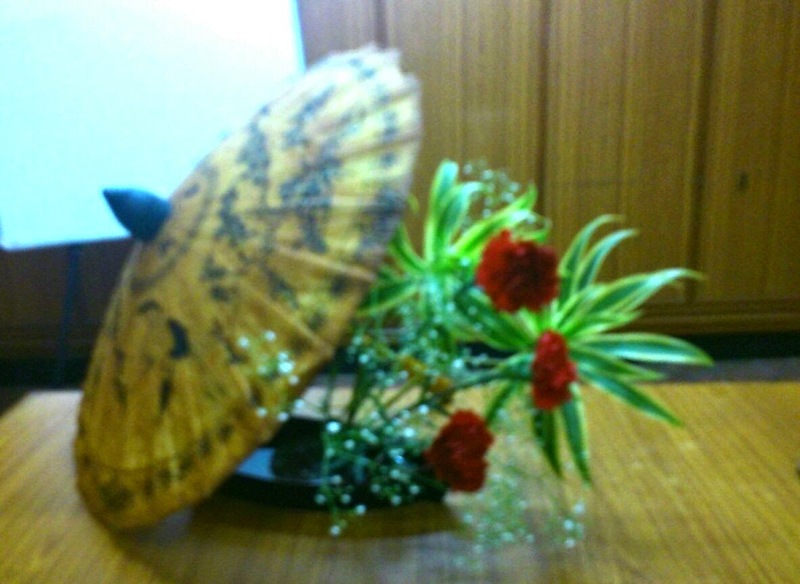 So, we all parted for the summer, and the Group will reassemble soon in June/July.